There may not be an official gold standard but there is certainly an unofficial one. This is conformed by the heavy buying of gold by banks, gold fund managers, the wealthy and even small buyers. All want to preserve their wealthy in gold. Central banks have shifted from being fairly consistent net sellers of gold to net buyers in 2009 and 2010, a trend that seems likely to continue. Mature economies seem to be satisfied with the amount of gold they own, and have withdrawn from selling. Countries that run trade surpluses, including China, India and Russia, are now putting some of that surplus into gold, big time. More vaults are being opened or constructed by banks to store gold. This is not a cheap activity so the small premium banks get for storage indicates that they are expecting a high volume of gold to be stored in order to make it worth their while. The Bank of Korea is purchasing gold in regular sizable amounts in an effort to reduce its US dominated holdings. And not just banks either. US States are getting in on the act. Utah was the first, enacting legislation to make gold and silver coins legal currency, Other States seem to want to follow with Minnesota leading the charge. And not just US States either. Entire Countries want to hold gold stocks. Venezuela has demanded all its gold back from Western Banks, China, as we know, is hoarding its own gold production as well as buying as much gold as it can from overseas and encouraging its citizens to buy gold. Same with India, and many other countries. Switzerland has been looking keenly at a proposal to introduce the Swiss gold Franc. Even Greece is adding to its gold reserves despite its crippling debt issue. 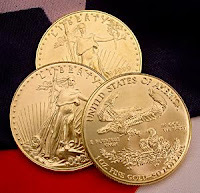 Gold bulls, such as gold-fund manager John Paulson, can foresee much higher prices for gold in the future on the premise that currencies hold little or no future for safety whereas gold continues to retain its value come what may. And, there is a waiting list for buyers of gold bullion and small quantities. Production is only just keeping up. Even eBay is acknowledging the market interest in gold with a special area now set up for gold buying and selling.